Three-year-old seedlings of two Tunisian provenances of cork oak (Quercus suber L.) differing in climatic conditions at their geographical origin were subjected to increasing light intensities. Gaâfour was the provenance from the driest site and Feija from the wettest site. Low-light adapted seedlings from both provenances were exposed to two light treatments: full sunlight (HL) and low light (LL, 15% sunlight) for 40 days. The CO2-response curve of leaf net photosynthesis (An-Ci curve) established under saturated photon flux density was used to compare photosynthetic parameters between leaves subjected to continuous low light (LL leaves) and leaves transferred from low to high light (HL leaves). Transfer from low to high light significantly increased net photosynthesis (An) and dark respiration (Rd) in Gaâfour provenance but not in Feija. After transfer to high irradiance, specific leaf area (SLA) did not change in either provenance. 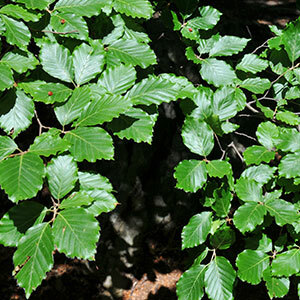 This suggested that the increase in photosynthetic capacity on a leaf area basis in HL leaves of Gaâfour provenance was not due to increased leaf thickness. Only the seedlings from the Gaâfour provenance were able to acclimate to high light by increasing Vcmax and Jmax. Improved temperature response function for models of Rubisco-limited photosynthesis. Plant, Cell and Environment 24: 253-259. Comparative photosynthesis of sun and shaded plants. Annual Review of Plant Physiology 28: 355-77. The effects of light acclimation during and after foliage expansion on photosynthesis of Abies amabilis foliage within the canopy. Oecologia 107: 21-32. Morphology and ecophysiology of tree seedlings in semideciduous forest during high-light acclimation in nursery. Photosynthetica 53: 597-608. Plants and resource mosaics: a functional model for predicting patterns of within-plant resource heterogeneity to consumers based on vascular architecture and local environmental variability. Oikos 94: 493-504. Photosynthetic acclimation of plants to growth irradiance: the relative importance of specific leaf area and nitrogen partitioning in maximizing carbon gain. Plant, Cell and Environment 24: 755-767. The allocation of protein nitrogen in the photosynthetic apparatus: costs, consequences, and control. In: “Photosynthesis” (Briggs WR ed). Liss, New York, USA, pp. 183-205. Photosynthetic limitation of several representative subalpine species in the Catalan Pyrenees in summer. Plant Biology 18 (4): 638-648. Plant phenotypic plasticity in response to environmental factors. Advanced in Botany 2014: 1-17. An improved model of C3 photosynthesis at high CO2: reversed O2 sensitivity explained by lack of glycerate re-entry into the chloroplast. Photosynthesis Research 27: 169-178. Photosynthetic capacity and nitrogen partitioning in foliage of the evergreen shrub Daphniphyllum humile along a natural light gradient. Tree Physiology 27: 199-208. Effects of nitrogen nutrition on nitrogen partitioning between chloroplasts and mitochondria in pea and wheat. Plant Physiology 96: 355-362. Ecological and evolutionary responses of Mediterranean plants to global change. Environmental and Experimental Botany 103: 53-67. Complex adjustments of photosynthetic potentials and internal diffusion conductance to current and previous light availabilities and leaf age in Mediterranean evergreen species Quercus ilex. Plant, Cell and Environment 29: 1159-1178. Does the photosynthetic light-acclimation need change in leaf anatomy? Plant, Cell and Environment 26: 505-512. Leaf anatomy as a constraint for photosynthetic acclimation: differential responses in leaf anatomy to increasing growth irradiance among three deciduous trees. Plant, Cell and Environment 28: 916-927. Leaf anatomy and photosynthetic acclimation in Valeriana jatamansi L. grown under high and low irradiance. Photosynthetica 43: 85-90. A hierarchical Bayesian approach for estimation of photosynthetic parameters of C3 plants. Plant, Cell and Environment 32: 1695-1709. Photosynthetic acclimation to changing light environments: scaling from the leaf to the whole plant. In: “Exploitation of Experimental Heterogeneity by Plants: Ecophysiological Process Above- and Below-ground” (Caldwell MM, Pearcy RW eds). Academic Press, San Diego, CA, USA, pp. 145-174. Photosynthesis is strongly reduced by antisense suppression of chloroplastic cytochrome bf complex in transgenic tobacco. Australian Journal of Plant Physiology 25 (4): 445. Photosynthesis in intact leaves of C3 plants: physics, physiology and rate limitations. The Botanical Review 51: 53-105. Response of leaf anatomy and photosynthetic capacity in Alocasia macrorrhiza (Araceae) to a transfer from low to high light. American Journal of Botany 79: 449-455. The significance of differences in mechanisms of photosynthetic acclimation to light, nitrogen and CO2 for return on investment in leaves. Functional Ecology 12 (2): 185-194. Photosynthetic and growth responses of Pinus koraiensis seedlings to canopy openness: implications for the restoration of mixed-broadleaved Korean pine forests. Environmental and Experimental Botany 129: 118-126. Effects of light and nitrogen nutrition on the organization of the photosynthetic apparatus in spinach. Plant and Cell Physiology 29: 143-155. Why are sun leaves thicker than shade leaves? Consideration based on analyses of CO2 diffusion in the leaf. Journal of Plant Research 114 (1): 93-105. Infection with the parasitic angiosperm Striga hermonthica influences the response of the C3 cereal Oryza sativa to elevated CO2. Global Change Biology 6: 919-930.